“By the power vested in me by the great State of Florida, I now pronounce you husband and wife!” I never thought I would live to see the day when I got to say those words but here we are, performing weddings in the Addison’s courtyard. George and Harlene were the first two to get hitched by me. That’s me on the left. The day started out dreary but the sun broke through at noon, just in time for the one o’clock service. I was surprised by the number of other guests we had who came back to the inn to watch and give a little round of applause at the end. The service went well and as far as I know, they are still married. We have had quite the run of elopements this Fall. Here are a couple of our most recent couples. I am so confident of the Elopement Special that I offer this guarantee: If, for any reason, your marriage does not work out you can come back to the Addison (regular rates apply) for a week of couples counselling. Your intensive sessions will include a king-sized bed, whirlpool tub, visits to the local day spa for a couples massage, shopping, fine dining at the local restaurants and moonlit walks through the historic district of Fernandina Beach. The Elopement Special is turning into quite a popular event. 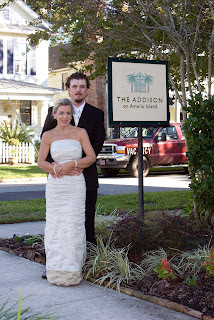 We have three more elopements booked this year and have three full weddings booked for next Spring. With the Elopement Package for $85 you get a dozen roses in your room and me performing your service. We have a nice selection of services to choose from and even do vow renewals. Need a best man? A maid of Honor? We’ll contact the Fernandina Beach Pirates Club and rent you a pirate. That’ll put the “Ahhrr!” in getting married.